After working in local hotels and restaurants as a young adult, Andrew Pern took over full ownership of The Star Inn at Harome in Harome, England, at the age of 25. He quickly fashioned this into one of the first ever “gastropubs,” winning awards regularly for Andrew’s cooking, which has always championed seasonal, local ingredients. Andrew has written two award-winning cookery books featuring recipes from the restaurant, ‘Black Pudding and Foie Gras’ and ‘Loose Birds and Game,’ the latter being Andrew’s game cookery bible. 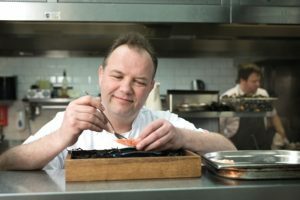 A popular performer at local food festivals, Andrew has made a number of television appearances including as a competitor on BBC’s Great British Menu in 2011, when he won his regional heat and narrowly missed taking his dessert to the final menu. More recently, his efforts have been on the expansion of his restaurant interests, assuming the role of managing director at The Star Inn The City in York, Mr P’s Curious Tavern in York, and The Star Inn The Harbour in Whitby. Reach location is very different, but all feature with Andrew’s instinctive ability to provide the best package of good, old-fashioned hospitality. Shaun O’Neale exploded onto the culinary scene in September 2016 when he claimed the title of America’s best home cook and was named Season 7 Champion of MasterChef on FOX. 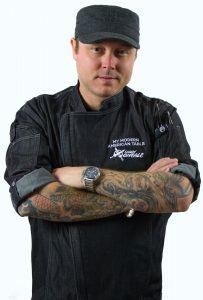 He graduated from reality star to culinary star in May 2017 with the release of his debut cookbook “My Modern American Table.” During his season of MasterChef, Shaun won over the palates of Gordon Ramsay, Christina Tosi, Daniel Boulud and Wolfgang Puck with his bold flavors and flawless presentation. He carried the same techniques that earned him a record-setting eight wins in the MasterChef kitchen through to the completion of his cookbook. “My Modern American Table” teaches other home cooks how to recreate Shaun’s upscale, modern American dishes like his lobster ravioli and salted caramel chocolate tart. Shaun is a self-taught chef who educated himself by reading cookbooks, studying the history of food and traveling the globe to absorb different cultures and flavors. Outside of the kitchen, Shaun has been orchestrating dance floors as a DJ with the highlight of his career culminating on New Year’s Eve 2011 as he became the first DJ to perform on Las Vegas Blvd in front of over 100,000 people.